As a life-long Apple fan I’m surprised to find myself going to the dark side – writing a positive but balanced review of the Amazon Fire Tablet – “Kids Edition”. 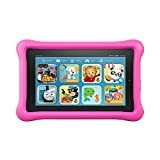 I’ve owned several iPad’s and tested and reviewed numerous inexpensive (sometimes “cheap and nasty”), 7 and 10 inch tablets for kids, and was impressed by this – as was my 3 year old granddaughter. As I work in IT, I’m aware just how confusing technology can be, so I’ll try to avoid references to jargon, and focus instead on the experience. I’ve broken the review up into sections so you can skip the bits you’re less interested in. With a years subscription to FreeTime and it’s huge library of age appropriate videos, books and games, a two year replacement policy and a great tablet, this seems pretty good value. Although not as sharp as the more expensive competition, the screen is clear, bright and colourful at almost any angle, and a pleasure to watch video or play games on. It is highly reflective, and pretty useless in bright sunlight, but otherwise great. While the low resolution makes reading very small text difficult, most text in FreeTime books is large and clear, and as a video player it’s a joy. Web performance is certainly fast enough, and it ran the graphically intense “Real Racing 3” with ease (so even good for older kids). Sound quality from the mono speaker was impressive, and at 7 hours, the battery life is pretty respectable. A bluetooth connection at this price is a surprising bonus (means you can keep the older one’s happy with a bluetooth speaker), although the front and rear cameras are basic, as is the low 5Gb of usable storage. At least you can add a huge (up to 128Gb) Micro-SD card to store more stuff. In conclusion, for a child from 3-12 year old this is a non-brainer. Four times cheaper than an iPad mini, and all the functionality. Note: If you think $99 is a bit much, scroll to the end for other buying options, and to see just what’s included in “the package”. 9/10 – Value for Money. 7.5/10 – Overall – very impressive. While this is double the price of the standard Amazon Fire 7” Tablet, you’re still getting a terrific deal. In addition to an impressive tablet and cover, you get two years accidental damage cover, and years subscription to Amazon Free Time. Amazon FreeTime gives every child their own profile and personalised login, content and bookmarks. You can give each child access to age appropriate games, videos and books (all selected by Amazon) without concern, after which they can discover for themselves what they like. The parental controls extend to the ability to limit the total time or by media type. For example, you can limit videos to one hour a day, but give unlimited reading, and shut down at 7pm. Personally, I’d delighted my 3 year old can discover what she likes within a password protected environment, and as she grows, so can her library of books and movies. The fact it’s “kid proof” and indestructible (or replaced free or charge) is a bonus. My only gripe, is there’s no physical “home” button like the Apple iPad (admittedly at 2-6 times the price plus a case), and it’s sometimes a little difficult to hit the exact spot on screen to press a “virtual button”. This means either a very young child will get frustrated, or they’ll learn useful hand-to-eye coordination. Not a show-stopper though – even for my little one. That’s a nice value! I’ve seen a few reviews where people are upset that it doesn’t work without Wi-Fi, but I’m not sure what their expectations are. If you have previously download an app/game/video and it doesn’t require internet access (some do, some don’t), it works fine. As for performance, it’s OK. Not great. It freezes every now and then and needs to be rebooted more often than I’d like to get it working again. This is frustrating to a 3-year-old, as you can imagine. Hard to complain too much given the price, but I was expecting it to be more stable. You will want to buy a micro SD card because the Fire OS takes up 5 of the 8 GB of on-board storage. This is where Amazon is doing something that is, shall we say, a little sketchy. When you customize your purchase, it allows you to select the “SanDisk 32 GB SD Memory Card for All-New Fire Tablets” for $19.99 (or more or less depending on the storage size), but gives you no other options. This SD card is by the looks of it the exact same as this one SanDisk Ultra 32GB Ultra Micro SDHC UHS-I/Class 10 Card with Adapter (SDSQUNC-032G-GN6MA) [Newest Version], except that it has a different paint job, doesn’t come with an adapter, and costs $6 more. So if you’re going to buy a SD card, add a different one to the cart separately. We have an old 3rd gen iPod touch for travel for my 13 month old daughter, but she expresses more interest in my iPhone 6+ than the tiny iPod. When Amazon launched this refresh, we jumped on it for an upcoming 3 hour plane trip. After spending 2 days using it, I’m satisfied with it, and it keeps the baby’s interest. Q: Which model of Fire tablets is this most similar to? A: I wondered, if this was a product all it’s own, or a re-packaged existing Fire. Inside the box, you literally get…ANOTHER BOX with the actual Fire tablet inside it. In that box is the actual $49 Fire, that has been given Amazon Freetime (kid’s apps/videos) access. You simply pop that tablet in to the foam case (it’s very tight – a good thing). So, it appears an extra $50 gets you the worry free guarantee, Amazon Freetime, and a foam case. Q: Is FreeTime content available offline, the same way you can download Prime video now? A: Best I can tell, no. I’m still researching this one, but I’m not having any luck. My workaround right now is do download Prime content in my profile, and switch to that when there’s no wifi. A pain, and I wish this was a feature. If I can have it in Prime why not in Freetime? This is why I only give 4 stars. Q: Is one year old too young? A: According the age on the box, yes (3 yrs)…but so far with a little assistance, ours seems to like it. The case is the right amount of chunkiness for her to hold, and the volume level is perfect at about 80%. Others have griped about it, but I actually like the fact that there’s no physical home button – our young daughter can’t exit videos or apps quite as easily. Finally, I really like the fact that I can pop it out of the case and use it with my own profile. Yeah, it’s a cheap lo-res tablet at the end of the day, but I don’t own an iPad or anything, so this is a nice screen to have laying around the house. It’s no retina display, but it’s a decent tablet to thumb through the news at the end of the day. I’m interested to see how the process of the Worry-Free Guarantee goes – but so far, we’re satisfied Amazon customers! As a family who owns multiple Fires in different iterations, I was thrilled when the kids’ version was announced. All three of my children received one. From their perspective, they were thrilled and loved it. I gave them far more time than usual to break them in over a 1.5 day period just to make sure everything was fine. Sadly, it wasn’t. First, let’s call this thing what it really is. This isn’t a Fire designed from the ground up with children in mind. It is a basic Fire 7 HD with an altered OS that is tightly integrated into the Free Time Unlimited app, something that can be added to ANY Fire currently on the market. That’s it. Yes, it comes with a snazzy case and a longer warranty, but it’s still just a slightly altered Fire 7 underneath it all. The issues began within the first hour of use and echo what most of the negative reviews highlight. My three-year-old first generation Fires last far longer and charge faster. When I first saw the case introduced, I imagined something rubberized with a protective cover over the screen, possibly even water resistant. No. It’s simply a piece of molded foam that you press the Fire into. There is absolutely nothing to protect the screen, reminiscent of the cheap EVA foam cases you pick up on eBay. I would not have felt comfortable simply putting them in a bag without something to cover the front. Plus, they are very easy to remove. We were averaging at least one lock-up per hour of use. And keep in mind that I had three of these, so it couldn’t have simply been a bad device. I was hard-resetting them like crazy. And this doesn’t count the times they randomly ran slow. While lots of content is great, it becomes overwhelming where there is no organization. The apps, videos, and books pages are a random collection of stuff. My kids didn’t understand that everything has to be downloaded and at a snail’s pace at that. And, being kids, they naturally want to try opening every app they saw listed. I don’t blame them for that. But that led to the next problem. The storage on this device is abysmal. I don’t understand what they did to bloat the OS to such a degree that it takes up nearly half of the 8G available storage (only 4.5 available to the user). With 100 apps to click on in Free Time Unlimited, one child was able to fill hers inside an hour of use. The others took a little longer, but I was furiously trying to keep up with deleting things on all three before long. And this lead to one of the most disappointing oversights I discovered. You can only delete data in the profile that is currently open. But here’s the real kicker. Wifi is designed to shut off when the device is full. In almost all cases, that ended up booting my kids out of their profile. Without wifi, I couldn’t log into their profile and could only access the adult profile. Since I had nothing installed on the adult profile, there was no way to free up enough space to reenable wifi, log back into the child’s profile, and delete items. This left a factory reset as the ONLY resolution, which is completely unacceptable. One of the biggest features I was excited about during the pre-release was the ability to use the camera. As it turns out, this one is now marked as “coming soon”. While I’m glad to hear it is being worked on, I think missing this at launch is a major fail. Yes, you can still use the camera but only on the adult profile, which defeats the purpose. And I’ve been around the block enough times with product launches to know “coming soon” is a promise I won’t hang my hat on. I read that the downloaded apps and books in FreeTime Unlimited are accessible when offline. After testing this theory multiple times, I found it to be false. If the kids were already in their profile when Wifi access was removed, they could stay for a while, but eventually, the constant messages about no Internet connection would boot them out sooner or later. And once out, it brought up a message about no Internet connection every time you tried to select a FreeTime profile from the list. Yes, you can still access the adult profile, which takes you to the basic Kindle. But what’s the point of that? The content is in the FreeTime app. Took off one star. Storage is atrocious (less than 5 gb available, and it fills up in no time), and Amazon makes it incredibly hard to delete content stored in a FreeTime profile. The easiest and most efficient way to delete content is to do a factory reset, but be warned, the tablet will be out of storage again in 24 hours. At this point, I do not recommend this tablet at all. 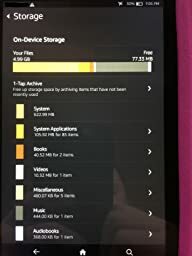 Go for a regular Kindle instead and get 16gb of storage. The problem is not the tablet; it’s Kindle FreeTime Unlimited. The tablet is sturdy and the case, although bulky, is perfect for kids. The tablet just arrived yesterday so I can not comment on how well it performs over the long term, but this will be our family’s 6th (7th? 8th?) Kindle and I expect it to be as durable as the other Kindles we’ve had. So on to Kindle FreeTime Unlimited… the idea behind this service is great (it’s pretty much a library of age-appropriate apps and books), but the execution of it is terrible. 1) In a regular Kindle, only the books that I’ve downloaded appear on my device. With Kindle FreeTime Unlimited, ALL of the books and apps available with Kindle FreeTime appear on the child’s Kindle. So what’s the problem with this? For one, it’s just plain difficult to navigate because there’s way too much content on the screen and there’s no way to sort it. Two, there are certain books and apps that Amazon might deem as age appropriate but I do not want my child playing with and there is no way to filter them out. So if I want him to read Curious George but skip the SpongeBob books, I’m out of luck. 3)Documents are not available with Kindle FreeTime. That means that all of the books that I’ve downloaded via gutenberg.org, for example, are not available. He can read them if I exit his FreeTime profile but then I lose control over what he can access. There might be some app that allows a work around and permit him to access docs, but I don’t want to waste time trying to figure out a solution to a problem that shouldn’t exist in the first place. 4) Apps and content that I’ve bought can be added to my child’s profile, but the process is very burdensome and time consuming. Ideally, I would be able to purchase online (or on my own Kindle) and deliver the content to my child’s Kindle (which is the way it works when you’re not using a profile), but the content is not available in my child’s FreeTime profile until I specifically add it to his account. In order to do this, I need to enter my password, enter the section that allows me to manage his content, and manually add the title. Unfortunately, Amazon organizes titles alphabetically only, so if I buy, for example, a book titled “Zebras” I would have to scroll past literally hundreds of titles that are in my account in order to add that one book to my child’s account. If you haven’t purchased a lot of content via Amazon, the process would be more bearable, but for those of us who’ve been buying Kindle books for many years already, the process is tedious. Conclusion: the tablet is great, but Kindle FreeTime Unlimited needs plenty of work. 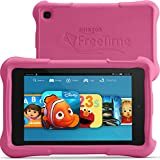 If you’re not satisfied with FreeTime Unlimited’s (lack of) parental controls, you might be better off with the regular, $99 Kindle Fire, a sturdy case and a 2 year protection plan. Edit: At the moment (as of 11/30/14), it makes no sense to buy this tablet given the discounts on the Kindle Fire 7. It’s currently priced at $109, and if you have an Amazon card and apply code HDL30ARC, you get an additional $30 off. The grand total before taxes is $84.21- that’s less than half the price of the 7in kid tablet. Get the tablet, a sturdy case and a 2 year protection plan. Suscribe to Kindle FreeTime Unlimited when it’s ready for prime time. Edit: Disregard the above as it no longer applies. I won’t delete it for the sake of transparency. Worst software and customer support ever! I am so disappointed with Amazon on this; I have had no problems with any of their products or their customer support in the past (on average, I place 2-3 orders with Amazon every week), but this product and their customer support regarding this issue has been abysmal and atrocious. As MANY other reviewers have noted, you run out of space VERY quickly on this (we’ve had ours for about a week) and we got the low storage notification. And sure enough, it disabled wifi and usb file transfer because there was low storage. Because it disabled wifi, it wouldn’t let us log in to the kids’ profiles to delete apps. If we can’t delete the apps, we can’t enable wifi. If we can’t enable wifi, we can’t log in. Vicious catch-22. So I called Amazon. First person I spoke with took down all my information (even though I had initiated the call through the website and selected the device) and then said she couldn’t help me and would have to transfer me. I get transferred and the connection is terrible; I could barely hear the second person. The second person said that I have to turn the device off and back on. I told them I had already done that and it hadn’t solved anything. They said I would have to do it again. So I did it, and of course, nothing happened. She then says she has to reset something on her end so that we can log in. I explain that it doesn’t make any sense that we would have to call in and spend 20-30 minutes on the phone every week to be able to log in to our device. She says there’s nothing she can do. Eventually I am able to log in to the kids profile, but when I try to go into settings, it just freezes. So I still can’t delete apps. We also get disconnected. I call Amazon back. Explain everything again. Get transferred again. Explain everything again. Get told it’s a software issue. I explain that it’s been a software issue for three months and nothing has been done. She says, “yeah, I know.” I said thousands of people have reviewed the product and MANY of the reviews mention the same issue. She says I have to do a factory reset and it might solve my problem. Might?!? So I ask her, is doing a factory reset the only way to resolve this problem? And she says yes. So I ask her, “does it make sense to you that a user has to reset their device and delete everything just so they can log in?” And she avoids the question for a bit, but finally answers, “yes, that makes sense to me.” What?!? I ask her, “so if you have a phone or computer and start running out of space, it makes sense to you that you would have to delete everything?” And she says, “no, that doesn’t make sense, but the Kindle isn’t a computer or a phone.” To which I say, “well, it’s a tablet and the basic operating functions work on the same principles as a computer or a phone.” Silence. After going around in circles and spending over an hour on the phone with Amazon (over an HOUR!!! ), the resolution is that she’ll send an e-mail to the development team (no, she didn’t know if they would respond or read the e-mail) and that I would have to just do a factory reset every time this happened. How can Amazon let these huge showstopping bugs get through to production?! ?